Super Smash Bros Ultimate brings back every character the series has ever seen, while adding a fair amount of new ones at the same time. One of the standout additions is the massive space pirate Ridley, the arch-enemy of Samus. Fans have been clamoring to get them in Smash for years, so you might want a few tips on how to play Ridley in Smash Bros Ultimate now they’ve finally arrived. Ridley is a big damage dealer, and you’ll want to know exactly how to use him before you start jumping into matches. We have you covered as we’ll go over his moves, strengths, and a few strategies on how to play Ridley in Smash Bros Ultimate. Ridley is one of the larger characters in Smash Bros Ultimate, though he’s not quite his usual size. As you might expect he’s a tank character, similar to Bowser, and his attacks can cause some huge damage, if you manage to land them. Ridley is very much a risk and reward kind of character, with the ability to dominate the battlefield, if he’s used right. Ridley’s special attacks are a bit difficult to use, and require you to get the timing right if you want to cause damage with them. Here’s all four. Neutral Special – Ridley’s basic special is plasma burst which shoots a bouncing fireball directly in front of him. You can charge the move by holding B to shoot a series of fireballs. This move works great as a ranged attack and it’s easy to hit enemies with. In particular, it works well for hitting enemies at a lower elevation than you, like on a lower platform. You can also use it to edge guard a little bit, and hit a recovering enemy with a bit more damage. It also causes a fair amount of damage, so it’s useful for raising your opponent’s percentage. Side Special – This claw attack charges forward and grabs an enemy, dragging them along the ground before launching them at the end of the attack. Obviously, this move only does damage if you manage to grab an enemy. It can be a bit difficult to use but it does decent damage and is good for launching enemies. However, it’s fairly easy for opponents to dodge if they time it right. This is best used on enemies that have high damage percent, as if you grab them near the edge you might even get a KO just by launching them with this special. Up Special – Ridley’s up special is surprisingly weak, and it functions kind of like Wolf’s does. Once you hit the input you can choose a direction and Ridley will do a short wing dash that direction. It does good damage and can launch enemies, but it’s very hard to aim exactly. When you’re recovering from a launch, the best idea is to usually use this move to go straight up and then glide down to safety. Down Special – Ridley’s down special is exceptionally hard to use, but its reward is well worth it. This tail jab causes huge damage to the enemy, like upwards of 30 percent damage at times. However, it needs to be timed exactly right, which isn’t easy to do. Ridley shoots his tail out straight ahead about one character’s length. If you manage to jab an enemy you can stun them and cause damage, setting things up for a follow-up attack. 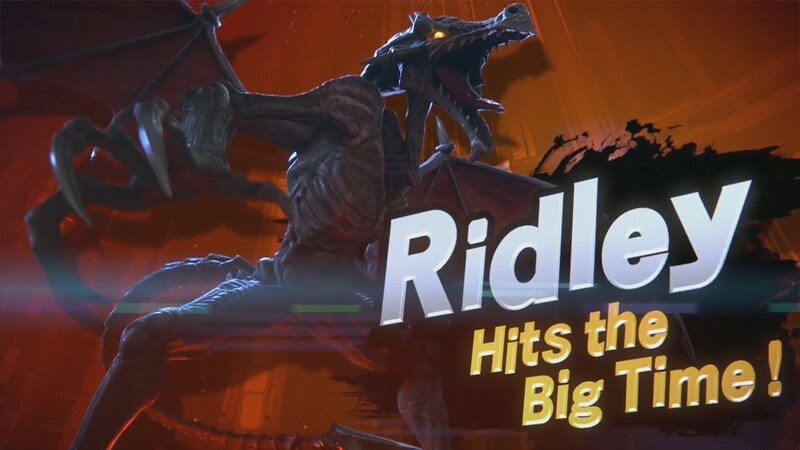 Strengths – Ridley is one of the best damage dealers in Smash Bros Ultimate, and his attacks have surprising range due to his tail. As a tank, he’s a bit faster than Bowser and he has pretty dominant aerial attacks. If you can get the timing of everything down, it’s easy to dominate the battlefield. He’s also able to soak up a good amount of damage and won’t really get launched until around 90 percent damage, unless another tank attacks. Weaknesses – Being one of the larger characters, Ridley has a huge hitbox that enemies can easily take advantage of. As we stated earlier, his up special is also a bit unwieldy and doesn’t have the kind of recovery range you might expect from a winged character. His specials also require exact timing windows making Ridley, by and large, one of the more difficult new characters to play. Whenever you’re playing as Ridley in Smash Bros Ultimate, you’ll want to go full offense and bring the heat on your opponents. Because of his high damage, this character can clear the field with just a few attacks. He’s one of the most agile tanks as well, so you can outmaneuver opponents with quick dodges and dashes while delivering big attacks. His down aerial can be a great damage dealer if you position yourself above enemies, as he stomps down into the ground. Always keep Ridley’s large hitbox in mind, however, as his height might open him up to attacks from above platforms that normally wouldn’t reach characters. In terms of throws, Ridley’s up throw is by far his most powerful, causing nearly 14 percent damage, so generally, use that one. With how specific Ridley’s specials are, it’s a good idea to jump into training mode in Smash Bros Ultimate and get a feel for how they work, and what they’re exact timing windows are. What it boils down to, like we said earlier, is that Ridley is almost entirely based around risk-reward. He’s not a character you play as when you want to play things safe, so go big or go home. Those are our tips for how to play Ridley in Smash Bros Ultimate. For even more tips and guides on the game, make sure to check out our Super Smash Bros Ultimate wiki. It’s filled with guides on how to unlock all characters, what the install size is, how to play as other new characters such as Incineroar, and Inkling, as well as how to get spirit points, how to level up spirits and how many spirits there are.